Genesee Community College student, Lori Mould had less than three weeks to prepare to travel across the globe when she received word she was traveling to China for a two-week study abroad trip. Lori, a Communications, Media and Fine Arts major, has recently returned from China with not only memorable photographs, but a greater understanding of the culture of the Chinese people. Lori learned of the SUNY (State University of New York) affiliated study abroad trip to China through a staff member at Genesee’s Arcade Campus Center. The China study abroad trip is associated with the China150 program in which the government of China and SUNY agreed to allow 150 displaced Chinese students affected by the massive earthquake in the Sichuan Province in 2008, to study at SUNY schools for one year free of charge. Continuing the relationship, China invited approximately 200 SUNY students to travel to Beijing and the Sichuan Province to study and experience the fascinating culture of China. The two-week, one-credit course entitled Discover China, was taught through the University of Albany and included students from several SUNY campuses. In order to be accepted in the program Lori had to write an essay, acquire letters of recommendation and have a valid passport and visa. Through the help of many Genesee staff members, Lori was awarded a scholarship to help off-set the cost of the trip. Lori traveled with the SUNY delegation December 27, 2009 through January 10, 2010. The group of SUNY students and faculty members spent a total of two weeks traveling in three major cities in China, including Beijing, the capital city, as well as Chongqing Special Municipality and Chengdu in Sichuan. While traveling in China, students observed both monuments of Chinese civilization from the past and evidence of China’s recent dramatic economic development. Ultimately, the goal of the cultural exchange was to confront preconceptions by observing and studying China’s reality. This reflective process was fostered through assigned reading and written assignments, such as a daily journal and reflective essay at the completion of the trip. Lori had the opportunity to visit the capital city of Beijing, Tiananmen Square, the Great Wall and the solemn site of the earthquake in Chengdu, Sichuan Province. Along the visits to these sites, she learned about China not only through lectures, but also through Chinese language lessons, music lessons and calligraphy. Lori is a very active member of the College community. Her volunteer activities at Genesee include Phi Theta Kappa Honor Society, Student Government, The New Courier student newspaper, and WGCC radio station. Lori is a non-traditional student, and went back to college after being out of an educational setting for 27 years. She has been on the President’s List since she enrolled in the spring semester of 2008, has been named Student of the Month, Who’s Who Among College Students and was awarded the Peg Tiede Memorial Scholarship. She was also elected as the student representative for Genesee Community College Board of Trustees. After graduating from Genesee, Lori plans on attending a four year school to earn a Bachelor’s degree. She hopes to someday work as a Photojournalist, as she enjoys traveling, writing about and photographing people engaged in positive work. A resident of Cheektowaga, NY, Lori has one son, Joshua, a daughter-in-law Jaimie, and a granddaughter, Autum Jaide. 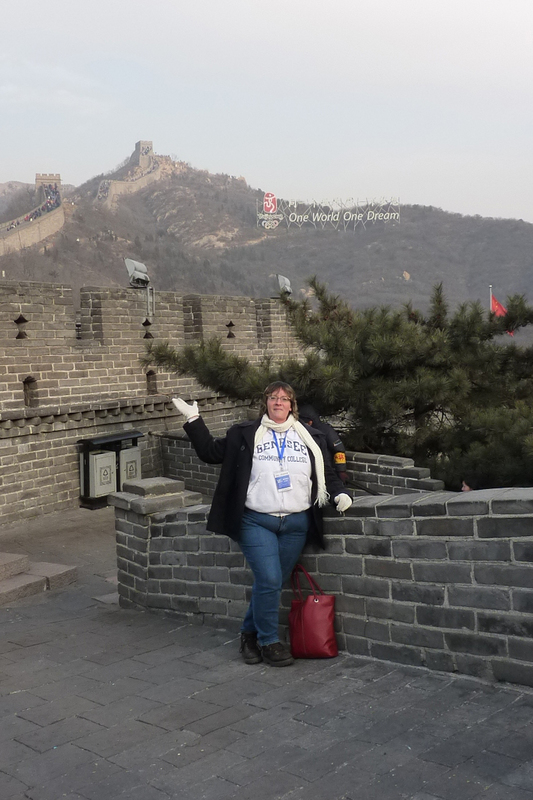 Editor’s Note: Pictured: Genesee Community College student Lori Mould at the Great Wall of China. Other photographs taken by Lori during her Chinese travels are available by contacting Donna Rae Sutherland at 585-343-0055 x 6616.